Certified Professional Pet Sitter. Bonded and Insured. WHAT IS 'IN HOME' PET-SITTING? The 'In Home' visit allows the pet to stay comfortable in the familiar surroundings of their own home, which eases any possible anxiety over the absence of their regular care-giver. You can have a sense of security and relief knowing that your beloved pets are well-taken care of while you are away. 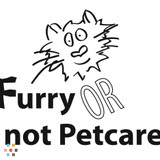 The mission of Furryornot Petcare is to provide reliable and loving care for ALL PETS that we have the privilege to watch over. Each pet will be treated with the same attention and kindness that we would want for our own loved ones. Bonded & Insured. Certified Professional Pet Sitter.